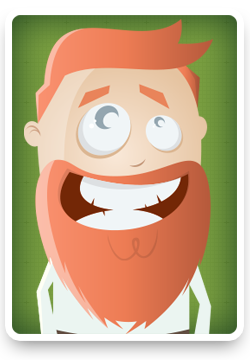 ChitChatChimp – The Chatbot Made Entirely From AWESOME! A SHORT LETTER TO ALL OUR FRIENDS IN THE MARKETING COMMUNITY. ... We first need to take a short trip back in time! Keep reading because I promise you this story and it's payoff for you will be worth it! We're heading to Chicago, it's 1904 and it's the very early days of 'modern' advertising. John E. Kennedy, a former Canadian mounted policeman is planning a career change. He's about to enter the world of advertising and while he doesn't yet know it, he's about to change it forever. Kennedy's search for new employment has brought him into contact with Albert Lasker. Lasker is shortly to become CEO of the Lord & Thomas agency. He will also become known as the "Father of Modern Advertising"
In their first encounter Lasker asks Kennedy to define advertising. Kennedy summed it up in 3 words: "salesmanship in print"
For Lasker, that reply brought with it a moment of clarity that would change his world and go on to shape ours. Within six months, Lord & Thomas became one of the three largest agencies in the nation. And their approach to selling with words changed society and how we buy things to this day. Salesmanship In Print... Kennedy understood even the best salesmen couldn't be EVERYWHERE at the same time. But he believed it possible to replicate their success (at scale) using the power of the written word. Sales Copy - Be it a long form letter, a short ad or a tightly written script for a radio or video commercial still works today... BUT SOCIETY IS CHANGING! Let's fast forward back to today. As consumer choice grows. The demand for 'customized ecommerce' and personalization has intensified. So the demands on our own businesses are changing too. Companies that focus solely on 'salesmanship in print' are being overtaken. Businesses that understand this renewed desire for direct interaction are gaining an advantage FAST! This demand fuels the development of Amazon and Apple's smart bots "Alexa" and "Siri". Facebook, Google, Microsoft and MANY other forward thinking businesses are building bots too. 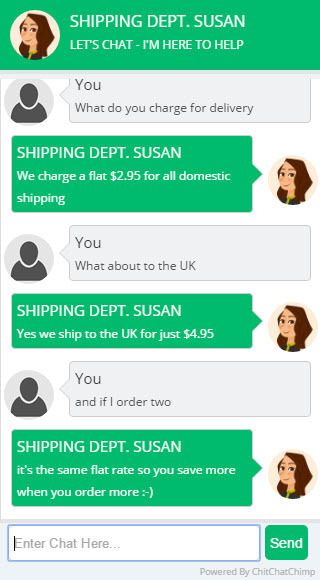 Their SMART BOTS are already assisting their customers as you read this page. But YOU Still Have A Head Start!.." You see, outside of these 'big players' it seems many business owners still haven't woken up to this change. Maybe it's been the cost of entry, perhaps it's the levels of technical complexity. The good news is that because you found this page, neither barrier need apply to you. Bots Can Boost Engagement On Any Website. Bots Can Respond And Assist Visitors When You Can't. Bots Can Turn Cold Prospects Into Paying Customers. Bots Can Keep Your Customers Coming Back For More. Bots Can Become Your Brand's Ambassador. Bots Can Save You Considerable Time And Expense. We understand you don't want to give up your traditional marketing methods completely. And the good news is you don't have to (right now you're still ahead of the curve). But recognizing this growing demand and taking action now is key. When Albert Lasker had his 'light bulb moment' back in 1904 it changed his fortune. We believe our new bot building platform 'Chit Chat Chimp' holds the same promise for you this year. We're already witnessing the revolution. Today you can choose to become part of it or ignore it and risk getting passed by. Chit Chat Chimp doesn't rely on messenger apps or integration with expensive 3rd party services to function. It's affordable and you can build then add a new bot to any website within minutes. Help potential buyers make a buying decision. 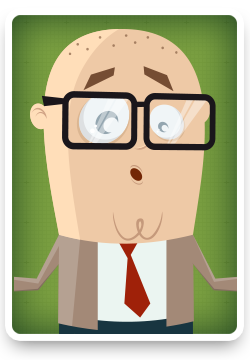 Answer and handle any sales objections to boost conversions. Upsell or cross-sell other products in your line up. Provide custom recommendations to products or services. Offer discount codes or remind prospects of sales deadlines. Just click on any of the above images to zoom in or click the buttons to watch a quick video presentation. 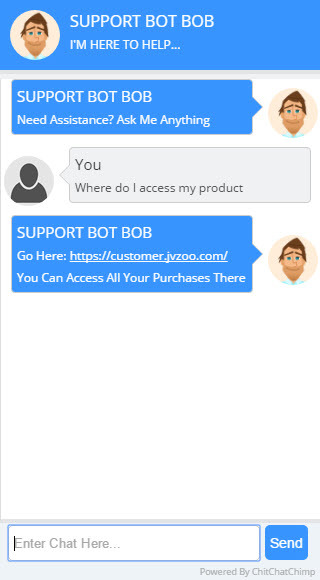 For support your bot's goal will be to reduce your workload and keep your customers happy, so you could teach your bot to answer common questions like "How do I assemble this widget", "Where do I access my product", "When will my package arrive? ", "How do I reset my password? ", "Where are the set up instructions?" 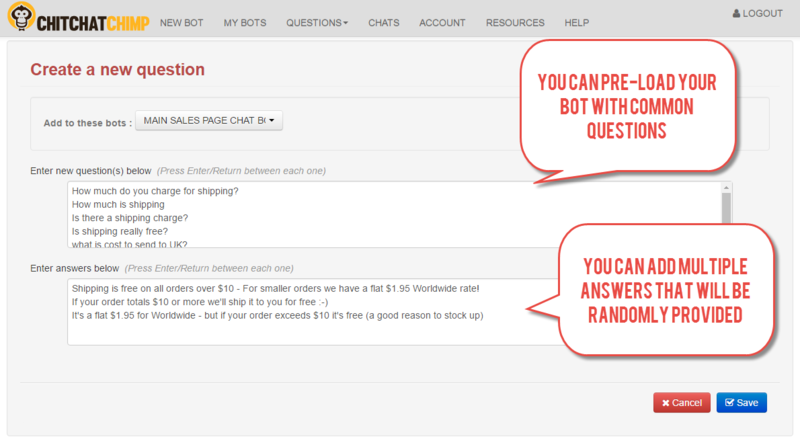 On a sales page your bot's mission could be to increase conversions, so you teach it to answer common pre-sales questions like "Does this product work in X country? ", "Do you offer a guarantee?" or "How does your product compare against X competitors product?" For market research and in instances where you simply want to understand your audience better, your bot could greet visitors with a question - Such as "What topic are you most interested in?" you'll get some great feedback for new product ideas and can further teach your bot to respond and make recommendations leading to sales. 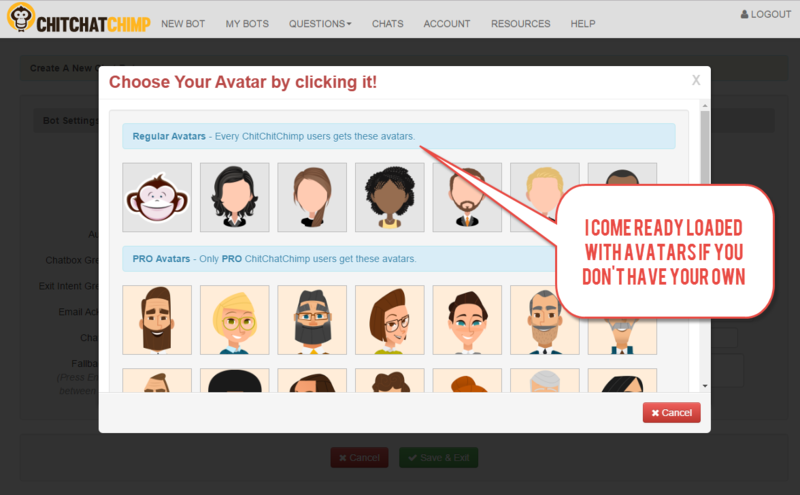 Chit Chat Chimp makes it easy to create your own chat bot for both personal and commercial use, you can then add it to your website and provide your visitors with improved support, sales assistance or even just for entertainment. Try It Yourself... Chat With Our Bot! 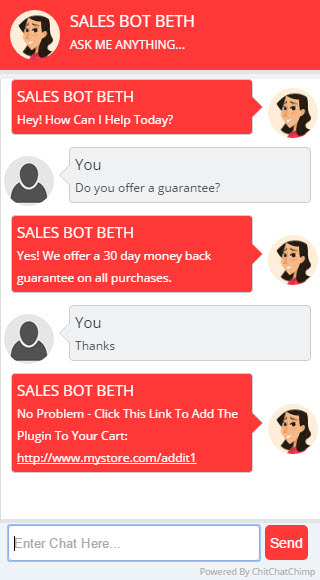 We've embedded our demo bot 'Chit Chat Chimp' into the page below (bots can be embedded in a page like this or a chat window can be triggered by clicking a tab) Chat with 'him' and get an idea of how your bot could interact with your visitors. Feel free to ask him anything! 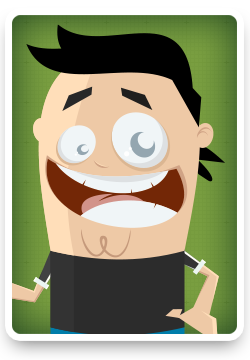 NOTE: Chit Chat Chimp is our demo bot, his look, style and personality are all unique to him, your bots will be unique to you/your sites. With the Chit Chat Chimp bot builder you can create similar bots to the ones above in less than 5 minutes... With ZERO technical skills! 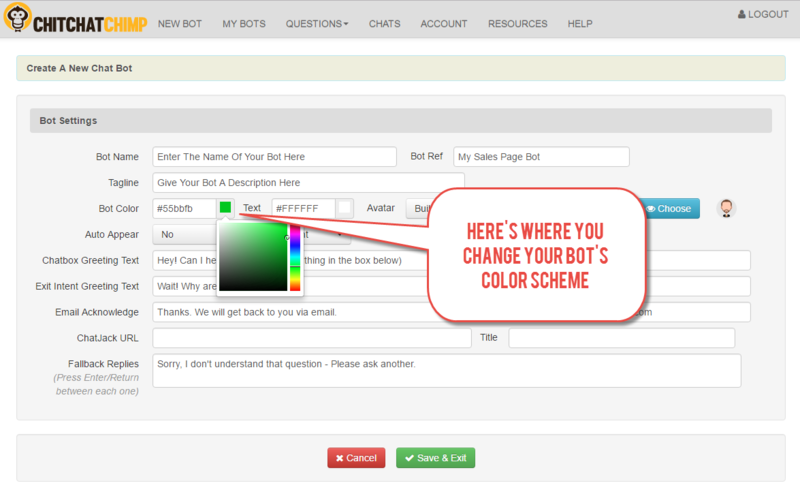 You'll simply 'fill in the blanks' choose a suitable name and tag for your new bot, choose the colors, pick or upload an avatar and set your greeting message and common fall back responses (if the bot can't answer a question) - It takes 5 minutes and your bot is ready to go! Now Anyone Can Build An Amazing Chat Bot Without Knowledge Of Programming! Now you know some of the amazing ways Chit Chat Chimp can help you every day, let's look at how it actually works. You see until now creating a chat bot for a website has been a cumbersome and technically frustrating challenge involving complex coding and weeks or even months of set up time. Chit Chat Chimp eliminates all that! We've made the process of making and customizing your bot point and click simple and training it both fast and fun. Just click on any of the images below to zoom in. Simply answer 'Unanswered Questions' add additional 'Pre Loaded' Questions and in no time at all your bot will be capable of answering ALL your site specific questions from your prospects, customers, members or subscribers. 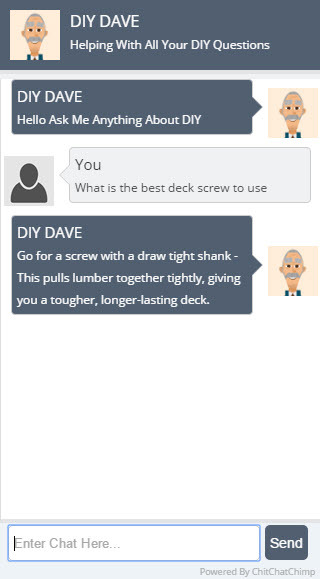 As your bot's answer database grows your bot will grow smarter too... We've built in a 'close match' question algorithm that works behind the scenes to provide answers to question that are NOT already in your answer database. If your bot doesn't have a pre-programmed answer available it searches it's answer database using this algorithm to find the best match and provide an answer. When this happens your bot will still save the question in your 'unanswered questions' but it will tell you it answered the question. You can then check if the reply was good and if so hit the save button, or you can edit the answer for all future replies to that specific question. NOTE: Your bot's answered questions can be edited easily (for instance if you change a refund period, revise a launch date or need to change a link). While you could choose to train one single bot to do everything in your business, you can also create and train multiple bots (depending on your account plan - see below) to do completely different things. For example one bot for sales and another bot for training your members. 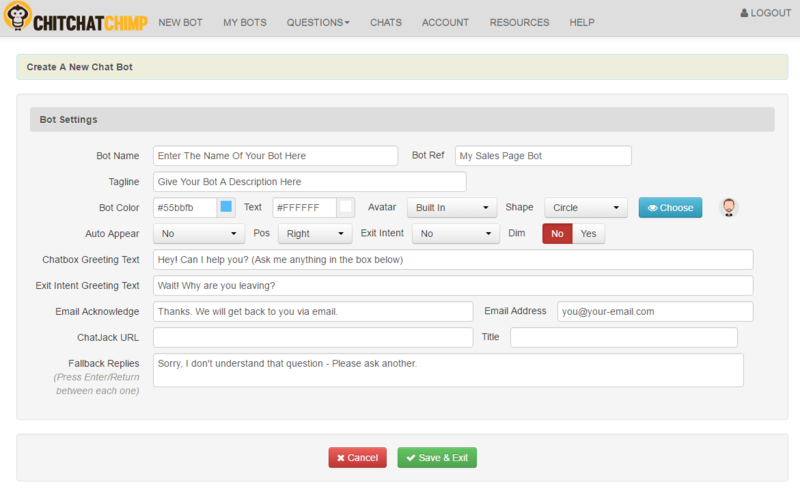 You can save separate answers for each individual bot PLUS you can save common answers for groups or all of your bots. Example: Let's say you sell two products each has different refund period guarantees. (30 days or 60 days) In this scenario if the question to be answered is "How long is your guarantee?" you would save the answer "30 days" to just a single bot. BUT if your policy is universal, then you can save the common answer "We offer a 60 day money back guarantee" to all of your bot's answer databases. Once you have created your bot adding it to your website is easy. We'll supply you with a short snippet of code to place in your page's code and that's it. You can then edit the look and feel of your bot at any time via your account dashboard and those new changes will instantly appear where you placed your bot (you won't need to touch the actual page again). You can also set where your bot appears on the page. Right or Left side (triggered by clicking the tab) or inline / embed in the page. It's NOT A.I. or Machine Learning, It's Better! Basically, there are two types of chat bots – 'unintelligent' ones that act using predefined conversation flows (questions and answers) written by real people like you and 'intelligent' or AI chat bots that use machine learning. Chit Chat Chimp is 'unintelligent' and we think that's BETTER!.. Why? Because unlike machine learning your chat bot will always represent and assimilate your personality, your brand’s identity, it will speak to your visitors just like you would, using your language or the language your customers speak... And you can craft responses to best suit the input from the visitor. "Cold and robotic" is often how people have described those conversations to us. And we've probably all seen what happens when machine learning bots go bad (remember when Microsoft's 'Tay' bot began spouting racist and xenophobic tweets!) This can NEVER happen with Chit Chat Chimp! Every response is learned from you or your team which makes the conversation experience for visitors far more realistic and authentic. Your visitors are essentially talking to you, asking you questions - It's just that now "you" can have multiple simultaneous conversations and "you" can have them 24 hours per day, seven days per week and 365 days per year. 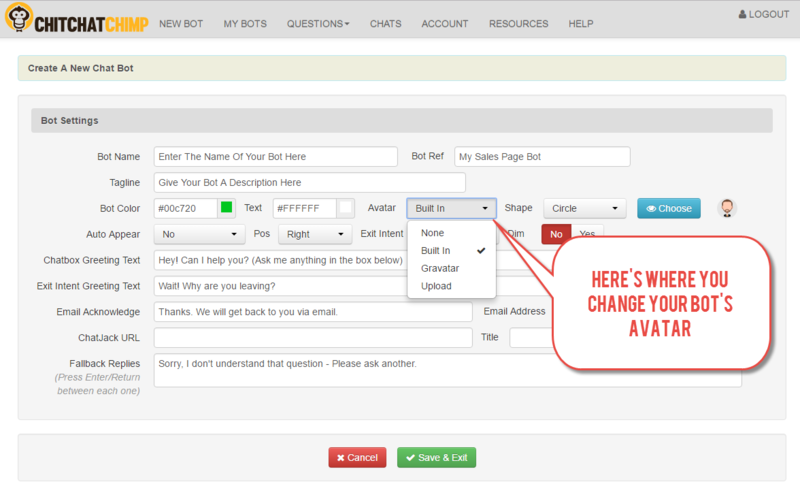 As you've seen, adding a chat bot to your site is straightforward... However what if you could also add a chat bot onto ANY website? This add-on has been the #1 most requested feature from the smart affiliate marketing Pro's that helped to form part of our beta testing team. And We've Built It! Of course you could use this feature to have fun too, but it does have a potentially highly profitable purpose, especially if you regularly send traffic to 3rd party sites from ads or affiliate links. Remind visitors about your affiliate bonuses, deadlines to buy and lots more! With the Chat Jacking feature enabled you'll get a short link to point your traffic towards. This serves the 3rd party site under your chat bot's overlay (don't worry we are not doing anything to the original site here - your bot is only seen by people who click your link) You simply add the URL you want to 'Chat Jack' and include a page title then distribute your special link. It works like magic! NOTE: Very soon this feature will be sold as an "add-on" extra but it's FREE for you today if you get the Unlimited plan. It's simple, fun and it's a great way to cut your personal workload, increase your profits and educate, help and entertain your visitors. Bots are set to change everything! And it's important you consider this stuff right now because we are standing before the biggest wave of technological and social upheaval the world will have EVER witnessed! The 'Internet Of Things' is coming faster than ANY advancement that has come before it and it's going to rapidly reshape customer demand and expectation - This revolution won't take 20-30 years like the home PC or the 7 years it took smart phones to achieve the same level of growth. You see the 'Internet of Things' is already happening all around us... And within the next year or two you'll either be at the cutting edge or you'll be nowhere! If that sounds alarmist - good! Because you need to be aware of what's happening! Do you think in a society where autonomous cars will drive your prospect to work, avoiding the jams all the while they sit in comfort catching up on email via their tablet ... or when their smart phones will find your friends, tell them what they're up to and where to go eat just by the swipe of their finger... that your customers won't expect and demand the same kind of instant responses from you? Think about it, if your fridge not only knows you're running low on milk but will place an order for it and have it delivered to your door later this afternoon why would you wait around for anything? In this new business environment, with everyone connected to everything Do you think your new customers will be happy to wait 24 hours for you to reply to their question via a support desk? When the world around your customers becomes INSTANT your ability to respond instantly will be essential. 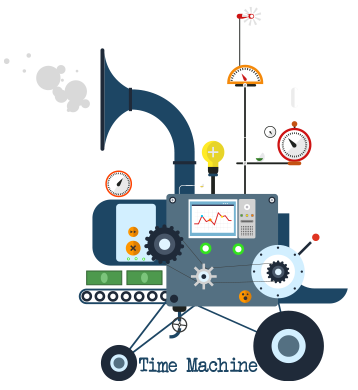 If you can't reply, respond or interact RIGHT NOW and ON DEMAND your business will look prehistoric. As marketing colleagues, as friends, fellow entrepreneurs and like minded business owners, we're jointly looking towards the near future and we see this huge 'internet of things meteor' hurtling toward us - So join us on this journey now, take advantage of this one of a kind opportunity and together we will adapt and take action to ensure our businesses won't fade into history like the dinosaurs. The time to act is now. There is no prize for ignoring these seismic changes that are happening... We truly believe that it's critical you commit to change now, to reach your audience faster, to enhance the perception of your business exponentially (shifting from market followers to market leaders) and with Chit Chat Chimp you can start with less effort, with reduced costs and with true unlimited potential! You can anticipate commonly asked questions and train your bot before you decide to make it live on your site. You enter the question "Do you offer a guarantee?" You then add the answer "Yes! We offer a 30 day money back guarantee on all purchases"
When you make your bot live it will already know the answer to this question and can respond accordingly. We recommend spending some time pre-loading Q&A's before making your bot live to provide your visitors with a better experience but it is entirely optional. During the 'learning phase' your bot won't know the answer to many questions so we give you the option to pre-load default replies such as "I'm sorry I don't know the answer to that question" or "I'll have to direct you to the help desk to get an answer on that"
You can enter as many default responses as you need depending on your bots purpose and how your business works. When you login to your account dashboard you'll see a list of questions your bot could not answer - Now you can go through these and provide single or multiple replies so the next time the bot is asked the same question it will know how to respond. Your Visitor: "How long will it take me to learn your system?" Your Bot's Default Reply (didn't know the answer) "Sorry, I don't have information on that - Would you like to contact support?" You add the answer via your dashboard: "Our system is simple and you can learn it in just a few hours"
You can also add in MULTIPLE replies to a question and the bot will use them randomly to create a more natural conversation. "What's the difference between roast beef and pea soup? -- Anyone can roast beef." "What did the fish say when he swam into the wall? -- Damn"
When you answer an 'unanswered' question it moves from the unanswered list to answered list where you can subsequently change or edit the replies if the answers ever need to be modified or updated. Can I View My Bot's Conversations With Visitors? We are offering several benefits to our launch buyers included the current discounted account plan pricing and guaranteed fixed priced renewal fees for the lifetime of your account. This means that irrespective of our future subscription pricing (which will be considerably higher) you will never be asked to pay more at renewal time than the amount you paid during initial sign up. Upgrading: If you have a 'Starter' or 'Smarter' plan you will be able to upgrade to an 'Unlimited' plan from inside your account if and when required. For annual subscription holders this upgrade price is fixed at the balance between what you paid for your initial account and the cost of the unlimited account at time of purchase. We guarantee to HOLD this fixed price for a period of 6 months. If you decide to upgrade beyond this 6 month period the upgrade price may be increased in line with public pricing. For example: If you purchase a Starter Plan today the purchase price is $67 and the cost to upgrade is $130 (both annually billed). We guarantee if you upgrade within the first 6 months of your account creation date this upgrade balance ($130) will remain fixed. Beyond this 6 month period ANY upgrade fee may be higher and will likely reflect the difference between the amount you paid during the launch period and the current public pricing of our Unlimited Plan. Once created your bot(s) can be added to any type of page by inserting a snippet of code into the page's source code or template. If you do not have access to your pages source code please consult your webmaster or service provider to do this for you. 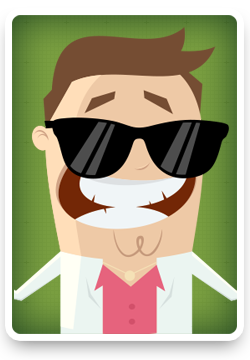 With our 'Starter Plan' you can create 1 bot and this bot is locked to a single domain. You can edit/delete this bot if needed but only 1 bot can be built at any one time. The bot will only function on it's designated domain, however you can change the bot's domain and transfer it to another domain if required. With our 'Smarter Plan' you can create up to 3 individual bots, each bot is also locked to it's own specific domain but all 3 bots can be placed on a single domain if required. This gives you additional flexibility and is currently the most popular account choice. Just like the Starter plan you can edit/delete bots and you can change designated domains for each bot whenever you choose. The 'Unlimited Plan' allows you to create any number of bots for your own personal use. 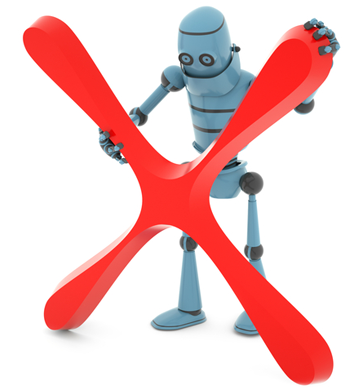 These bots are NOT locked to specific domains and can be used on multiple domains if required. This is our most flexible plan. For all accounts chat logs will be stored for 30 days. If you wish to retain chat logs beyond 30 days ensure you have downloaded them to your computer (you can download each chatlog as a text file from your dashboard) as once deleted they cannot be recovered. All plans have ZERO restrictions on the number of chats bot have nor are there limitations on the number of questions and answers that can be stored in their databases. We do not currently offer a white label or plan for users wishing to use our software on their client's websites. If you currently have clients that need a bot, feel free to recommend they create their own account at ChitChatChimp (you could do so via your affiliate link) and you could incorporate the management of their account within your service charges. We do not permit users to charge or request fees for use of their personal account or to offer our software as part of their service. We may introduce this type of plan in the future if sufficient demand exists. Currently the 'Chat Jacker' functionality is only available with Unlimited Plans. If you pay for support staff that's an instant $1,800 a year saving. If you handle support yourself you'll be gifting yourself 90 extra hours per year to do something more productive or fun. "Thanks for dropping by, what topics should I write more about on my blog?" 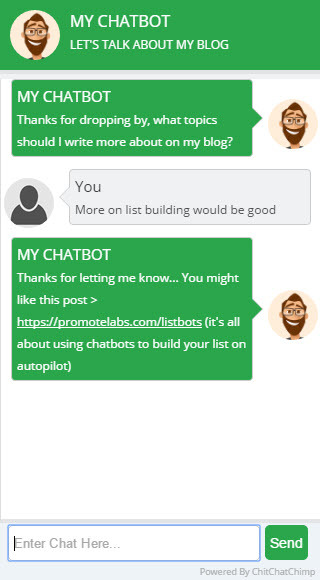 YOUR READER "More on list building would be good"
BOT "Thanks for letting me know... You might like this post (url) it's all about using chat bots to build your list on autopilot"
See what just happened there? Thanks to Chit Chat Chimp not only do you know what your readers are interested in, but the next time someone responds they want more on 'list building' your bot can direct them to other posts, landing pages and even paid offers relevant to them - Further increasing their engagement with your site and guaranteeing they'll be back for more. Making that work is super simple too... You simply enter a default response (used when the bot doesn't have an answer) as something like "Thanks that's going on my list of topics" or "Awesome thanks for letting me know"
If a reader ask for a topic you don't have any resources for, it will simply thank them for their answer with a default response, but if you do have a good resource to share your bot will share it in it's reply. That's great for your readers and great for you too! You could easily create a niche specific bot to help your audience. Because the Chit Chat Chimp bot builder is a platform (SaaS) you never have to worry about updates and upgrading the software. It is all handled behind the scenes so you will always have the most up to date version of the builder. All updates are included with your subscription and you will never be asked to pay more for new versions etc. You can reach out to support at any time via the contact link inside your dashboard and we have a growing collection of training and help docs via the main support page. Should you need help we'll be there for you.